and 186 juris doctor degrees. From San Francisco to Dublin and Chicago to Vienna, graduating seniors are heading off to jobs and graduate schools in cities all over the world. The class of 2018 has secured jobs at top-notch companies, including Amazon, Deloitte and the National Institutes of Health. Students are continuing their education at some of the country’s premiere graduate institutions, including Yale, Harvard and University of Virginia School of Medicine. 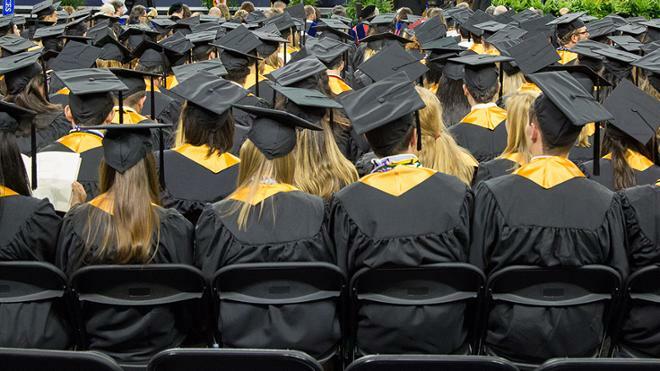 Students who are the first to attend college in their families will be recognized this year. The 117 self-identified first-generation college students will wear special cords during Commencement acknowledging their first-gen identity. The class of 2018 includes 52 international students who represent 22 countries. More than 200 Arts & Sciences students in the class of 2018 conducted undergraduate research in arts, social sciences, humanities and sciences. The highest percentage ever of Richmond Law’s graduating class — 23.8 percent — earned the Carrico Center Pro Bono Certificate for completing 120 hours of service throughout their three years. Their contributions totaled more than 5,400 hours. Robins School of Business graduates completed 12 international residencies, traveling to Verona, Italy, and Zagreb, Croatia. MBA graduates completed capstone projects with 13 local companies addressing an issue closely tied to the strategic direction of an organization. The Jepson School of Leadership Studies class of 2018 logged more than 17,000 hours putting theory into practice during their Jepson Internships. Internship sites spanned the globe—from the halls of the U.S. Capitol to a hospital in Tanzania. Through study abroad, research and internship programs around the world, 64 percent (521 students) from the class of 2018 studied abroad with university support. During the 2017-2018 academic year, graduates of the School of Professional and Continuing Studies’ Teacher Licensure Preparation program logged a total of 27,675 teaching hours to fulfill their student teaching requirements. More information on Commencement speakers and ceremonies is available in this media release.